Mexico City has banned restaurants and cafes from serving all food except takeaways in a bid to help prevent the spread of the deadly swine flu virus. 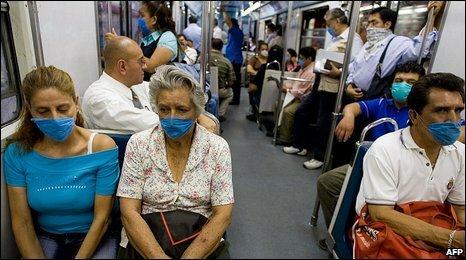 Schools across Mexico have closed and public gatherings are restricted, after more than 150 people are believed to have died from swine flu. The number of cases globally is rising, though no-one outside Mexico has died. The UN has called on countries to check their contingency plans for a possible global epidemic, or pandemic. The UN’s World Health Organization (WHO) chief Dr Keiji Fukuda said a pandemic was “a very serious possibility, but it is still too early to say that this is inevitable”. As officials in Mexico City announced the latest measures to stop the virus spreading, the city’s chamber of trade estimated restrictions in the city were costing businesses there at least 777 million pesos ($57m or £39m) a day. After Mexico – where the outbreak started – the US has the highest number of confirmed swine flu cases with 64. President Barack Obama has asked Congress for an additional $1.5bn (£1bn) to bolster the US response. In California, where there have been 11 cases, Governor Arnold Schwarzenegger has declared a state of emergency as a precautionary measure but stressed there was “no need for alarm”. In another development, the UN’s Food and Agriculture Organisation is sending a team to investigate claims that industrial pig farms in Mexico were the source of the outbreak in humans. The agency’s chief veterinary officer, Joseph Domenech, told the BBC that the FAO had to act following rumours that people had been falling ill last month near some intensive pig farms . Other countries around the world to have confirmed swine flu cases are Canada, New Zealand, Spain, Israel and the UK. Several other countries are investigating suspected cases including Australia, Brazil, France, Chile and Denmark. The WHO says it is “critical” that travellers from Mexico who might be infected be identified, but it has advised against countries imposing border restrictions or travel bans, saying such measures do no work. Some countries in Asia, Latin America and Europe are screening airport passengers for symptoms, while tour operators in France and Germany have suspended trips to Mexico. Cuba also suspended flights to and from Mexico for 48 hours from Tuesday and a Canadian tour operator, Air Transat, said it was also halting flights to Mexico until 1 June. The WHO raised its pandemic alert status to level four on Monday – two levels from a full pandemic – after concluding there had been sustained transmission between humans. Levels five and six are reserved for when there is widespread human infection. In almost all cases outside Mexico, people have been only mildly ill and have made a full recovery. The US Centers for Disease Control and Prevention said on Tuesday it may abandon the term swine flu because some people wrongly think they can catch it from pork. Pork producers in the US and Brazil are pushing for the name ‘swine’ to be changed , saying it is damaging their business. China, Russia and Ukraine have all banned pork imports from Mexico and parts of the US since the outbreak began.